Welcome back to another Game of the Year list. This year, I’ve tweaked the format again — many of the games I played in 2014 were released in previous years. Sometimes, I played the old game “as is”; sometimes, I played a new port or an expanded version of the old game. So I’ve broken this post down into two parts. First, I review the accomplishments of 2014. And second, I take a look back at the notable games I played, whether or not they were originally released that year. This week’s song begins slowly, and it’s not as “attention-grabbing” as, say, the music that plays during the finale. Give it 30 seconds. I love how it builds to a higher, hopeful note. Enjoy! Change of format this week – I’m including the video on the front page. I’ll revert this if it ends up lagging the page; otherwise, it should spare the need to click through. This week’s song (by Austin Wintory, of Journey fame) is The Banner Saga‘s main menu theme. It’s very short, just 45 seconds, but it’s lovely and does a great job of setting the emotional tone for the game. Enjoy! 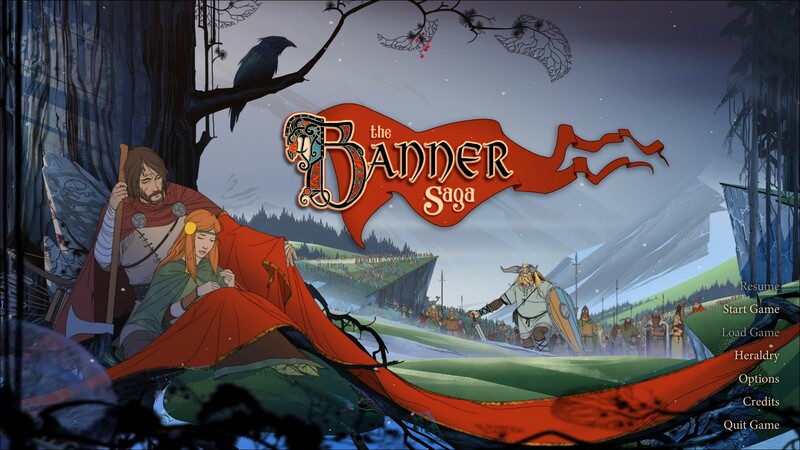 Take a moment before starting the game — Banner Saga has a gorgeous title screen. After finishing The Banner Saga, I thought I’d expand on the conclusions I reached last week. I’m still happy with the game and its tactical battles, which become deeper and richer with each new character introduced. I do want to revisit story, an area where Banner Saga is ambitious, inconsistent, but ultimately successful, notwithstanding flaws in its narrative structure – specifically, its use of two distinct stories told from two main points of view. This gives the main story a purpose, escalating tension, an arc. The side story lacks these, and isn’t even well integrated into the larger tale. From a mechanical perspective, I like the side story – it was there that I got the hang of the battle system. But it drags on narrative pacing, and should have been either plotted better or else cut down to brief interludes. As for the main story itself, it’s good. It is clearly part 1 of an intended trilogy, all but screaming TO BE CONTINUED, and suffers from several niggles. At times, characters will say something jarringly modern (1), or Abruptly Drop Proper Nouns. The characters themselves are tersely introduced, with the non-plot characters only receiving a single conversation to flesh them out. But Banner Saga redeems itself with moments of emotional power – desperate, heroic, poignantly beautiful. It’s those moments that stick in my mind as I write, moments that made me breathe “wow”, and “this is awesome”, and “that was perfect”, and my complaints pale next to that. Taken together with the very good battle system, The Banner Saga is an impressive outing by Stoic Studio, and I look forward to the next in the series. The basis of my comments: I finished the game after 17 hours, per Steam. So opens Stoic Studio’s The Banner Saga, a low-fantasy tactical RPG with a cool and unique combat system. It’s so different as to be divisive; but the more I play it, the more I like it. By way of overview, Banner Saga follows two separate groups as they trek across a land ravaged by shadowy, armoured monsters called dredge (second from the right). Between battles, the current group’s caravan rolls through the countryside (see below), banner streaming behind, and gameplay consists of text events: how do you respond to stubborn villagers, or a troublemaking drunk, or a fire in the distance? These choices affect caravan morale and hence stats in combat, but more importantly, party members can join, leave, or permanently die in these events. And clearly, the developers meant decisions to have consequences, a la XCOM ironman – there is only one quicksave slot, and save ‘checkpoints’ are widely spaced. This is perhaps too effective: I’ve started looking up guides after discovering that I neither enjoy character loss, nor have the time or patience to reload. The actual writing is clunky at first (why are quasi-Vikings saying “OK”? ), but picks up steam. As at the 60% mark, I find the story interesting, albeit not the main draw. 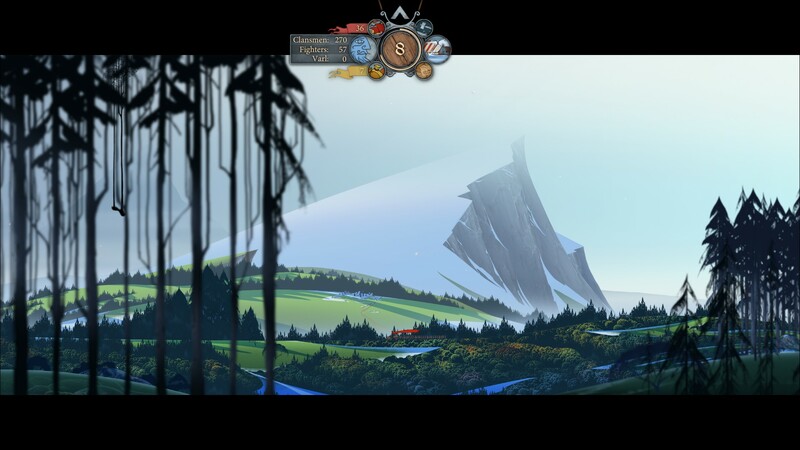 The Banner Saga’s lovely overworld.